Beautifully engraved certificate from the Salon.com issued in 2001. This historic document was printed by the Thomas De La Rue Company and has an ornate border around it with a vignette of the company's logo. This item has the printed signatures of the Company’s Chief Executive Officer, Mr. Michael O'Donnell. Salon.com generates its revenue through advertising and sponsorships. In late 2000 the company cut about 20% of its workforce to reduce its expenses, and in 2001 launched a subscription-based, premium service. Rainbow Media Holdings owns about 8% of the company. Other investors include Bruce Katz (former owner of The Well), who owns nearly 7%, and Adobe Ventures, which owns about 6%. Salon.com is a leading Internet media company that produces 10 subject-specific, demographically targeted Web sites, maintains Salon Shop, an e-commerce gateway,and hosts two communities -- Table Talk and The WELL. In May 2000, Salon.com acquired MP3Lit.com, the pioneering Web site offering quality spoken-word and audio literature recordings in MP3 and Real Audio formats. Salon.com's network of Web sites combines the thoughtfulness of print, the timeliness of television and the interactivity of radio. Salon.com's award-winning content consists of 10 sites which provide news, features, interviews, and regular columnists on specific topics, from business and politics to parenting and entertainment. Strategic distribution partners include TheStreet.com, AvantGo, CNN.com and CNet. Journalism veterans David Talbot, Andrew Ross, and David Zweig founded Salon Internet in 1995. Targeting a literate audience attracted to highbrow content, the trio launched Web-based Salon Magazine with financial backing from Adobe Ventures, Apple Computer, and Hambrecht & Quist. With essays by Camille Paglia and an interactive Table Talk section, Salon soon caught the eyes of the mainstream media. Time magazine selected Salon as the best Web site of 1996. Michael O'Donnell, a consumer software executive, became president and publisher that year. Salon's coverage of the death of Princess Diana in 1997 brought a cluster of new visitors to its Web site. By the end of the year, the company had attracted additional financial backing from Japanese publisher ASCII Corporation and Borders Group. With inquiries into the dealings of President Clinton dominating the headlines in 1998, Salon began delving into investigative pieces. Its coverage of special prosecutor Kenneth Starr's Whitewater investigation helped usher Salon into the spotlight. The company secured 1998 distribution agreements with America Online (now AOL Time Warner), the Go Network (now Walt Disney Internet Group), and CNN Interactive. In 1999 Salon expanded from its original magazine format and began offering a variety of Web sites. O'Donnell became CEO that year, and the company also bought subscription-based online community The Well. 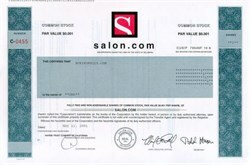 Salon also bought the rights to the salon.com URL from a Texas beauty-store operator (the magazine had previously operated under a variety of URLs). After changing its name to Salon.com, the company went public in 1999 using a Dutch auction allowing potential shareholders to bid for shares. Salon.com subsequently made its content available to users of wireless devices and inked a deal with Rainbow Media Holdings to develop television content. The company acquired MP3Lit.com, a Web site offering spoken work and audio literature recordings, in 2000. Later that year Salon.com used the content it acquired through the MP3Lit.com purchase to create audio download Web site Salon Audio. The company also did a little belt-tightening and cut its staff by 20%. In 2001 Salon.com announced that it would produce a weekly radio show to be distributed by Public Radio International. The company also launched a subscription-based service to deliver premium content.